When you walk in the moonlight the feeling is so different from a walk at dawn. Even when the light is cool and water shimmers from a low winter sun, the quality of light from the moon evokes more reluctant blue thoughts, blue, and subconscious. The full moon coming up on Tuesday is often called a snow moon as it tends to be the coldest part of the year. February moons really are distinctly strange and strong. This super moon is closest to the earth and appears large in the sky. It is obdurate and solicits you to enquire within. I walk with my dogs, their white markings glow like beacons. 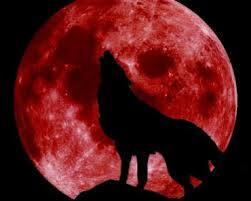 The moon could have me howling; it’s been a tough couple of years. Geese fly over our heads and I remember how my mother used to love seeing them too. I think of matriarchal winter, the triple goddess in the moon. Maid, mother, and crone: my grandmother, my mother and me huddled in coffee shops together, sharing moments. Letting the moons pass by in each other’s company, our lives intertwining and finally unraveling. Walking under this moon I recall how strong my grandmother had been in the face of all that she dealt with in life – and it was a lot. Even when she lost her only child my mother, she kept herself going day after day. It was because I saw her so selfless as she accepted the finality of my mother’s death with such fortitude, that I was able to hold myself together when inevitably I lost her too, almost a year later. No, however inevitable something might be, we still struggle against it. I felt like an orphan of course, still do, but compared to what my grandmother dealt with, I’ve had it pretty easy. What’s easy about death? The moon makes us face it. The moon month after month tells us make the most of now because there are only so many more moons in your lifetime. It’s why I will always walk in moonlight. I was so abject after last year that I allowed myself some new companions: the sort of dogs that I grew up with, dogs that I have been promising myself ever since I left the family home thirty years ago. Thirty years of promising. That’s about 365 full moons. On full moons now some yogis and friends gather, we build a fire on the meadow, the moon shining up at us from the river. Sometimes we dance, sometimes we write. Sometimes we just sit and chat and drink mulled wine. It has happened a few times that the full moon coincides with one of our yoga retreats, and then it is a magical combination;of mantras and dance and feeling fit. It’s a good feeling to know that every full moon is spent with people I care about and admire, because pretty soon my life will be spent too, and I wouldn’t be able to hide any regrets from the stark blue light of the moon. Tagged as death, full moon, moon salutes, Snow moon, yoga moon, yoga retreats. Stella Shakerchi and Chris Leuenberger invite you to join them in their yoga & creativity retreat held at Casina Settarte, a permaculture paradise and retreat center for somatic dance and performing arts in the beautiful nature of Puglia, Southern Italy. While on your leisure time you can go for extensive strolls in the surrounding pine woods and olive groves, swim and play at the nearby beach and maybe after dinner join mantra chanting to calm your mind. Chris Leuenberger is a Swiss dancer / choreographer working internationally. Both are 500hr RYT yoga teachers. Casina Settarte is a place where the sun is reflected on the white roofs of the Trulli sprouting here and there amongst the green of olive groves. Here daily life is marked by the principles of love for the land, mindfulness and care for every living being. Founded in 1993 in Puglia, Italy, Casina Settarte is a centre for creative development and education alongside the practice of sustainability, a place of creative research and experimentation surrounded by nature. Comprising two dance studios and multi-use outdoor spaces, the centre focuses on movement, arts & crafts and permaculture with a particular focus on dance and contact improvisation. Casina Settarte runs projects, courses and workshops throughout the year, lead by the Casina staff and visiting teachers. – One large dance studio / yoga shala of 200 square meters with wooden floor. The space is protected from sun and rain and has open sides with blinds that can be pulled down for further protection from wind, rain or sun. – One small studio 7x5m with wooden floor, central heating and a wonderful view. Casina Settarte is surrounded by 2 hectares of land with Olive groves, fig trees, wild herbs (thyme, capers, oregano), almond trees and an organic garden which you can use for relaxation, research and creation. The Casina Settarte community recently built a Geodesic dome 7 meters in diameter for open air activities. The wooden structure is comprised of a complex network of triangles, hexagons and pentagons and is particularly suitable for energy work and meditations. During this retreat you will have two daily yoga classes with Chris and Stella. Experience extensive sessions of Vinyasa yoga, kundalini, restorative yoga, and celestial communication (mantras with extended mudras) in the evening. You will start your day with a 90 minutes Vinyasa class in the morning sun. After your class and relaxation session you will have your breakfast. There is sufficient time to rest, go for a walk in the surrounding nature or treat yourself to a massage until lunch. If you can’t get enough of the yoga, we will give the option of taking a shorter Kundalini yoga class right before lunch. Should you wish to spend a larger portion of the day swimming and relaxing at the nearby beach or going on an excursion for trekking or sightseeing, we can arrange a picnic lunch. On Sunday, Tuesday and Thursday we will offer a 90 minutes restorative evening yoga class with meditation or yoga nidra. typical of Puglia, based on genuine daily products – lots of fresh vegetables and fruit naturally grown on the Casina Settarte permaculture farm. 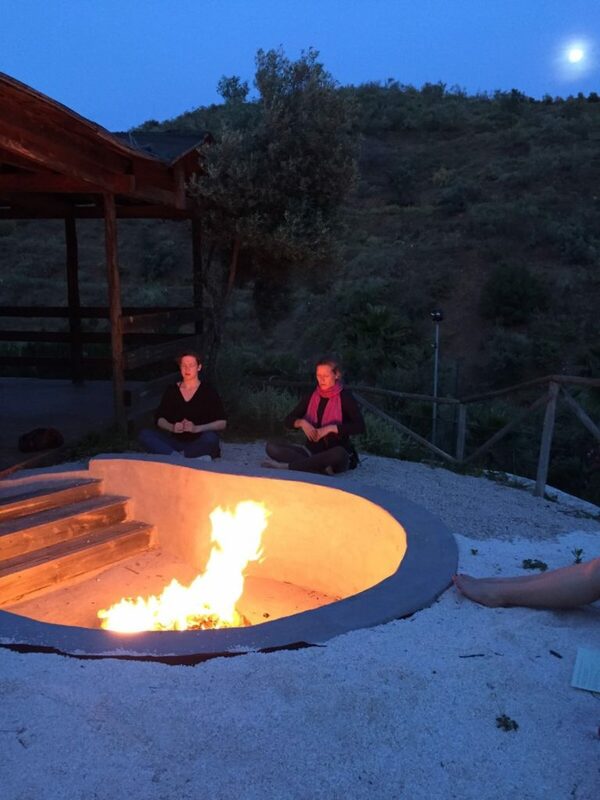 You can use the large Casina Settarte permaculture estate with its pine forests and olive groves for leisurely walks / hikes and to explore your personal meditation, mindfulness or movement practice. We can arrange trips to the beach, to the famous whitewashed town of Ostuni or to the …. Valley for more extensive trekking and sightseeing. Maybe you feel like treating yourself to a massage. Massages are offered at favorable retreat prices. Arrival is on Saturday afternoon, September 22nd. Departure is on Saturday, September 29th by noon-time. As we are in a remote place we can help you arrange your travel plans so that we can all save time, money and the environment. We provide a free shuttle service from the train station of Ostuni (15 minutes from Casina Settarte). The nearest airports are Bari and Brindisi. From Bari and Brindisi it is easy to reach Ostuni by train (half an hour from Brindisi, 1 hour from Bari). Car sharing makes the cheap rental cars even cheaper. At Brindisi or and Bari airport you can rent a car starting from 80 € per week. We will send an email before the trip and put all interested participants in contact. Can I extol the virtues and delights of a summer in Britain anywhere nearly enough? When the sun comes out here life is a holiday. I have never seen a smile quite like the look of wonder as an English gent takes his pint outside to sit on the pub wall in the sun; as a child trundles up to the rock pools and realises the sand is warm; as the surfer takes her dog to the beach and they spend the day together playing in the waves; as the old couple sit and enjoy the fragrances and colours of the garden they have spent years creating together. Paradise. The word comes form an old Persian word ‘Pardeiza’ meaning ‘Garden’. Summer lets your bones relax. Your body opens up, time opens up, space expands. It all seems a lot better than it was and life is good. In Oxford today we chanted the Antaar Naad Mantra. ‘Antaar’ is the essence of and ‘Naad’ is the sacred sound. It is a full moon meditation which names the infinite origin, and the creativity on earth, woven together and projected through sound. This mantra gives mastery of the spoken word, protection, and wisdom of past present and future. We practiced a kundalini kriya called Moon Kriya, where we chant “Har!” (creation) while moving our hands to stimulate one of our moon meridians. We also practiced Kriya to Make You Enchantingly Beautiful. Yes there is such a kriya. This ends with the mantra “Hum” which means We, uniting us because as Russell Brand will tell you: we are all One! We also chanted the first lines of Guru Gobind Singh’s powerful prayer, Jaap Sahib: the wonderful Mul Mantra, considered the highest mantra. It talks of Primal Truth, of Creator and creation being one. Truth within and in the universes beyond time, beyond birth and death. It contains the root of sound that is the basis of all mantras. It orients like a compass to keep consciousness of our soul. Then we chanted Chattr Chakkr Varti, which brings you back to your power, aligning it to the power of nature pervading in all the four directions, self – illumined and united with all. These are the last four lines of Jap Ji. Chattr Chakkr Varti removes fear and anxiety. It instills courage, fearlessness and brings victory. It gives self-command and self-grace. And to seal in all that mastery, power, truth and grace, we chanted “Ad guray nameh, jugad guray nameh, sat guray nameh, siri guru deve nameh” which means ‘I call on the primal wisdom, the wisdom true through the ages, the true wisdom, the great unseen wisdom.’ You are guided from the primal core through every moment of experience, in your heart’s deepest truth by the infinity of your highest self. This mantra clears clouds of doubt and surrounds the magnetic field with protective light. 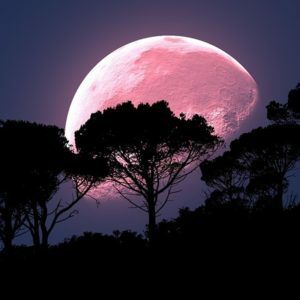 Tomorrow on 28th I will celebrate the June full moon – called Strawberry Moon by native Americans, also Rose Moon, Mead Moon, and Hot Moon – by swimming in the river at Portmeadow. The water is warm and the moon is tantalising as it promises secrets to be found in the depths. Swans pass silently by with signets and geese fly over. The ducks are outrageous as usual and sometimes the horses stop to take a drink at the opposite bank. This is when it feels so good to be on the planet – and it doesn’t cost a thing. Wahe Guru! Our gut talks to our brain. Probably in many ways, one way Enders mentions is by sending impulses via nerve fibres. When your gut is struggling, your brain does not function as well as it should. Depression and memory loss have been measured in controlled experiments to be affected by gut health. A healthy microbiome – a diverse happy mix of gut bacteria – is essential for good physiological health. It’s not just mood and memory that are affected by insufficient gut bacteria. As with the FODMAP reactions, severe arthritis, psoriasis eye problems, eczema, problems arising from an aggravated immune system, as well as clinical depression can occur. When gut bacteria from people with depression was administered to rats they all developed depressive behaviours that they had not displayed before. We don’t need to harm rats to know this, everyone instinctively knows there is a huge link between gut and brain function. It is just that decades of doctors insisting that food has nothing to do with your health has thrown people off the path. Enders points to a hopeless situation where a woman was at death’s door with digestive problems, so as a final last ditch attempt they used some of her husband’s gut microbes essentially as a suppository and she was completely healed within weeks. It was because he had healthy gut microbiome and it worked to stabilise hers. If you are a vet or work with animals, you will know that this has been in use for decades. The sterile requirements for human medicine make research slow. It’s great to be clean, but as with the FDA when they told Nun and cheese maker Noella Marcellino (more on her next week) to stop using a wooden bucket and use a stainless steel one instead. They thought they were doing the right thing keeping everything sterile, but of course there needs to be a certain amount of good bacteria around to deal with the undesirable bacteria. Using a stainless steel bucket resulted in e-coli, eventually arguing her case, in 2014 Marcellino was allowed to go back to using the wooden bucket. We all know (I hope) that wood is an excellent self-cleaner and has its own natural oils for that. The same applies to your gut. You need exactly the right balance of good and bad bacteria to keep everything balanced. 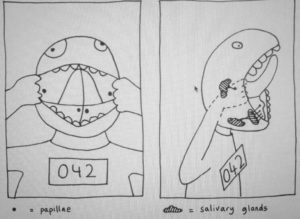 Enders includes some wonderful entertaining drawings in her book “Gut” which illustrate the whole process of digestion from the thought, aroma and sight of food, to our responses days after eating. She makes biology fun, which I never thought possible, and she allows for the fact that there is a huge amount yet to be done in gut research. I read the 2017 revised edition, she first presented the material in 2012 which you can see on YouTube and published the book in 2014 it is academic with full references. Her final few pages are devoted to encouraging our ‘Clever Cravings for Fermented Foods’ Her description here is a great reminder to steer ourselves away from processed foods. We naturally know what is good for us, true, but foods that we would never want to eat or drink are disguised by the addition of things that our bodies recognise to make them palatable. The result is that we willingly eat and drink all sorts of things that are awful for our health. So fine is this process, that just the addition of citric acid can fool us. It is ‘something that several million years of evolution has not been able to prepare us for’ A glass of water loaded with sugar (as much as in a Coke) would be undrinkable and disgusting. Add a small amount of citric acid (representing the phosphoric acid in Coke) and suddenly you have a delicious drink. It is because our bodies are familiar with acid from fruit and in combination with other foods it gains our trust. So yes we do know what’s good for us, but when combined or processed? No. We most certainly do not! Throughout the book Enders explores the idea of fermented pre-digested foods as one way to encourage a balanced micro biome. In the final section she shows us how to use good bacteria to ferment vegetables. She recommends cabbage, carrots and gherkins that are organic and have no pesticides on them. Some foods that encourage good flora are asparagus, artichokes, onion, garlic, parsnip, potato salad, sauerkraut, yoghurt, leek, salsify, endives. Things from the sunflower family. Eat them regularly. Try it. See how you feel. Next time Noella Marcellino and the wooden bucket. Love your beautiful belly! Yes your belly is more likely to be its naturally flat beautiful self when you eat low FODMAP foods, because there is less struggle for your small and large intestines to complete digestion of some difficult fermentable foods, sugars, and polyols. “What?” I hear you say. Polyols. They are sugar alcohols, which is the ‘P’ in FODMAP. The other letters stand for Fermentables (to be broken down by bacteria); Oligosaccharides (which just means few sugars); Disaccharides (two sugars); Monosaccharides (one sugar); A (just stands for and); Polyols. These Fermentables, Oligosaccharides, Disaccharides, Monosaccharides And Polyols have short chains that are not broken down in the small intestine, and for some people their large intestine does not have the required bacteria to break them down either. Remembering that your gut is your second brain – or my better brain as I like to call it – of course its nervous system will be upset by all the bloating and struggling to deal with the FODMAP foods, which are also described as short chain carbohydrates such as fructans, sorbitol, lactose, and fructose. Most people think of the heart line, and the spine as being essential lines through the body, but in yogic medicine especially we are invited to be very aware of our gut and how it behaves. It has a huge number of nerve endings and it is an accurate barometer of health. The main precept of Kundalini and Ashtanga is Prana/Apana balance. Prana is the energy in the body, or all the upward energetic movements in the practice. Apana is the eliminating or dissolution force, or all the downward insular movements and rest phases in the practice. Yogis are constantly keeping antennae poised to find this balance, not just through practice, but through meditation and nutrition as well as Ahimsa and compassionate living balanced with Tapas – the fire of will and action. This diagram shows the different possible ways food can act in the gut. The lumens are just small openings inside the intestinal structure. These can get swollen with fluid when trying to deal with foods that are mismatched to the wrong gut. Yoga wants us to be completely aware of our bodies and have union all round, which puts us in the position to be our own physicians. We have the expertise we need within, it just needs accessing. Gluten is not strictly a FODMAP as it is a protein, but it can cause trouble for some: gluten-free products contain far less oligosaccharides and fructans than gluten products. Remember the classics: Hippocrates ‘Let your food be your medicine, your medicine be your food’ i.e. Listen to your gut!